The Industry runs on three primary things; one is GDP, second is growth in infrastructure and the third is mining. The company realizes that because of the GST more and more hub and spoke is happening which is resulting in the size of the truck becoming larger. The company expects that the infrastructure-led demand will continue and the GDP will continue to grow on the back of GST. The company believes that the hub and spoke model will continue to play in their favor, and they expect that the international markets will also continue to do well. The company sees high fuel prices and overloading as a cause of concern for the MHCV industry. The company sees the growth in the north region by 20% to 25% as the reason for the volatility in the market came. The company’s volume went up by 15% for trucks and buses, whereas, revenue went up by 32%. This indicates that the size of trucks is becoming larger. Rating got upgraded to AA+ for the first time in 20 years. Ashok Leyland was the only company in the world which launched the iEGR-based BSIV because the company believes that it is a simpler thing to do for Indian markets. The company believes that keeping things simple and easy helps in reliability. The company sold over 100000 trucks in India equipped with iEGR technology. The company received its second Deming award for its Hosur 2 plant. Ashok Leyland is the only commercial vehicle company in the world with two Deming awards which is like a pinnacle of quality. The company has grown at a rate of 30% per year in its after-market business. Power Solutions Business of the company has grown by 14% over FY17 with positive margins. The company has also started to export. The company witnessed its international operations growing by about 36% over FY17 primarily due to the very strong demand in many of its markets. The company has been able to maintain its position in the top 40 brands in India. ET rated Ashok Leyland as one of the best places to work. Company’s CSR activities in Tamil Nadu has been rated as the best CSR activities in Asia. The company has launched various initiatives for the after-market, one of them being the service mandi platform. The company does not see a requirement of a new plant for chassis assembly. The company is facing a shortage in capacity for bus body building. Hence they are building a plant in Vijayawada. The company will continue to invest in engines, gearbox, frame, etc. to release deeper bottlenecks. Focus of company is on making vehicles which are best in class in terms of operating cost. The company was in a debt of about 6500 crores some five, six years ago. Currently, they have record cash of about 3000 crores in the bank now. Company’s goal is to protect its margin. They will not give away their margin for the sake of market share or the sake of commodity increases. The company has been successful in maintaining its margins in double digits. For Q4FY18, domestic truck business accounted for about 70%, and buses accounted for roughly about 7%. Exports for Q4FY18 was at about 5.5%, but for the full year, it was at about 8.6%. After-market revenues for the company were about 5% roughly. The company got a revenue contribution of about 7% in the FY18 through LCV and in FY17, it was about 6.3%. The company is satisfied by its operating leverage; there has been a 0.8% increase that has happened. For FY18, overall domestic truck business was 66%, and domestic bus business was 7.3% of the revenues. And Defence revenues accounted for nearly about 3%. In FY18 Company saw a roughly 35% growth in exports; and 35% growth in Defence. The company expects the profitability of LCV business to be on par with the overall margins. Discounts went down in Q4FY2018 on an average basis. Company’s foundry business finished with a positive EBITDA of about 5%. The company increased the price by 2% in April. The company will launch two new product platforms this year. One is the high horsepower range of vehicles which are tippers and tractors and second is the world’s first 41-tonne with five axles with twin tyre lift. The company is expecting to launch the 41-tonne in the second quarter. The company launched the Dost Plus last year. It is the only commercial vehicle sold in the country with zero discount. This has helped the company to enhance its margins substantially. The company expects a price increase of 6% to 8% on the overall pricing because of the changeover. The company expects a cost increase of 1 to 1.5 lakhs and a price increase of 1.5to 2 lakhs from BS -IV to BS - VI vehicle. The company feels a requirement of an upgrade for OBD to be used in BS-VI vehicles. The company is confident that it will manage the cost as well as the quality of OBD because they own a company that makes SCR systems. The company expects a strong pre-buy before BS-VI because of the increase in prices. The company is working on three different strategies for the electric technology. Out of the three strategies, first is a fast charge, second is a swap, and the third one is called flash. The company is ready with the swap, and it was showcased in the auto-expo. The company took the Ahmedabad contract because the it decided to target only one city, in the beginning, to do it well. The company expects to deliver 40-50 vehicles in Ahmedabad; they will have to start delivering in the next four to five months. The company expects to commercialize in the next 4 to 5 months. The company has decided that it will also try other technologies in Ahmedabad. The company has witnessed a growth of 37% over FY17 in the LCV business. The overall LCV segment is about Rs.220 crores. The company expects to expand its range of 2 to 7-tonne LCV by April 2020. The Board has approved of an investment of around Rs.400 crores for the LCV business over the next three years. The company expects an industry growth of about 10% for MHCV for FY19. The company hopes that high fuel prices will not have an adverse impact on the MHCV industry. In India MHCV to LCV ratio is between 70% to 80% LCV and balance MHCV. ICV is about 20% of the total MHCV TIV. The company expects some of the 16-tonne segment to shift out in future. Ashok Leyland is the fourth largest bus manufacturer worldwide, and are the largest heavy bus manufacturer in India. The company saw a substantial de-growth in the bus business last year. The company has products in three segments, first is ICV (school bus and staff segment), this is about half the business, second is intercity buses with 30% business and last is TIV (state transport) with 20% of the business. Company purposefully slowly exited from many state transport businesses because of the difficulties. The company continues to gain market share in the other two segments. For LCV, there is a growth of 21% in TIV largely driven by the hub-and-spoke. The company has gained market share by 1.5% in LCV. 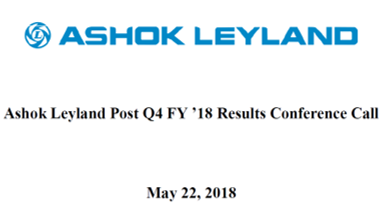 Ashok Leyland is the second largest Defence private player to the Government of India. The company has won about 12 tenders in the last year, and another 13 tenders a year before. These tenders that the company has won alone could be about Rs.5000 crores in the next five years. The company has grown at 30% per year for the last two or three years. The company is looking at other aspects whether it’s LCV, Defence, after-market, customer solutions, international areas to grow them at a faster pace than the truck business. The company wants to focus on the aspects mentioned above to make the company less prone to the cyclicality of the truck industry. The company has expanded its product portfolio; earlier it only used to sell logistics vehicle, now it is selling bullet-proof vehicles and mine protected vehicles to state police like J&K police and Punjab police.